Beautiful certificate from the Countrywide Financial Corporation. This historic document was printed by the American Banknote Company and has an ornate border around it with a vignette of the Company's name. This item has the printed signatures of the Company’s Chairman, Angelo Mozilo. 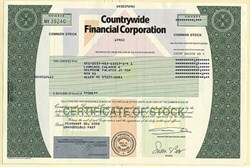 Countrywide's stock has been described as the "23,000% stock" by Fortune magazine. Between 1982 and 2003, Countrywide delivered investors a 23,000.0% return, exceeding the returns of Washington Mutual, Wal-Mart, and Warren Buffett's Berkshire Hathaway. The endgame in Bank of America's $4 billion takeover of Countrywide Financial began with a December phone call from Countrywide Chief Executive Angelo Mozilo to his Bank of America counterpart, Kenneth D. Lewis. And on January 11, 2008, Bank of America announced it had agreed to buy Countrywide for $4 billion in an all-stock transaction. The stock's value settled at about $5 1/2 per share following the announcement; it had been as low as $4.43 before the Bank of America deal was announced. "The ability to get that kind of size and scale became more appealing as we saw the business model change to a model we could accept," Lewis said. "We considered the lawsuits, the negative publicity that Countrywide had. We weighed the short-term pain versus what we think will be a very good deal for our shareholders." The deal is a landmark in the housing crisis, given Countrywide's prominence as the nation's largest mortgage lender, at least until recently. On June 4, 2009, the U.S. Securities and Exchange Commission charged former CEO Angelo Mozilo with insider trading and securities fraud, and former COO David Sambol and former CFO Eric Sieracki with securities fraud for failing to disclose Countrywide's lax lending standards in Countrywide's 2006 annual report. On January 11, 2008, Bank of America announced that it planned to purchase Countrywide Financial for $4.1 billion in stock. On June 5, 2008, Bank of America Corporation announced it had received approval from the Board of Governors of the Federal Reserve System to purchase Countrywide Financial Corporation. Then, on June 25, 2008, Countrywide announced it had received the approval of 69% of its shareholders to planned merger with Bank of America. On July 1, 2008, Bank of America Corporation completed its purchase of Countrywide Financial Corporation.